This quality engineered Dry/Wet Laminating Machine presents outstanding performance in multiple layer laminating operations. A variety of flexible packaging materials, Ex : BOPP, CPP, PET, PE, Nylon, electroplating aluminum foil…etc. • This quality engineered Dry/Wet Laminating Machine presents outstanding performance in multiple layer laminating operations. • The laminated products provide reliable resistance against vapors and general gases. • It handles various types of poly cell bags and laminated bags, making products oil proof, water proof, freeze resistant and boil resistant. • It accommodates a wide range of film materials such as PET, BOPP, CPP, Nylon, PE, aluminum foil and metalized films. Dry Laminating Machine, Laminating Machine Feature：Minmum waste, User-freindly operation, faster & easy set up. 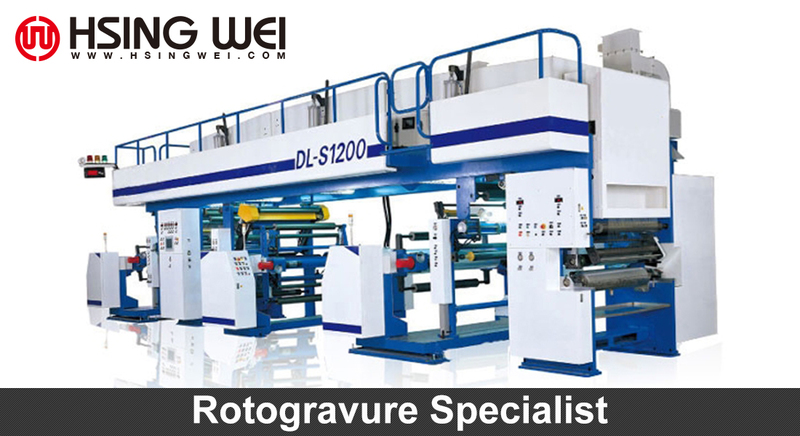 Hsing Wei is a Dry Laminating Machine, Laminating Machine Manufacturer, Dry Laminating Machine, Laminating Machine Supplier, and specializes in Dry Laminating Machine, Laminating Machine and related flexible packaging equipment with over 40 years’ experience on this field. Hsing Wei provides the latest technologies for Dry Laminating Machine, Laminating Machine, turnkey equipment, manufacturing management, operation training and after sales service.